What is The Future of The South African Rand? News and Events move the markets - or do they? Replay of Webinar on 17 February 2015 with Scott Picken of International Property Solutions (IPS) interviewing James Paynter, of Dynamic Outcomes, on the drivers of the Rand and what is expected to happen with the Rand going forward. This was part of the "EmPower Yourself - get the FREEDOM you want!" webinar in which Scott also interviewed Clem Sunter on the outlook for the local and global economy. 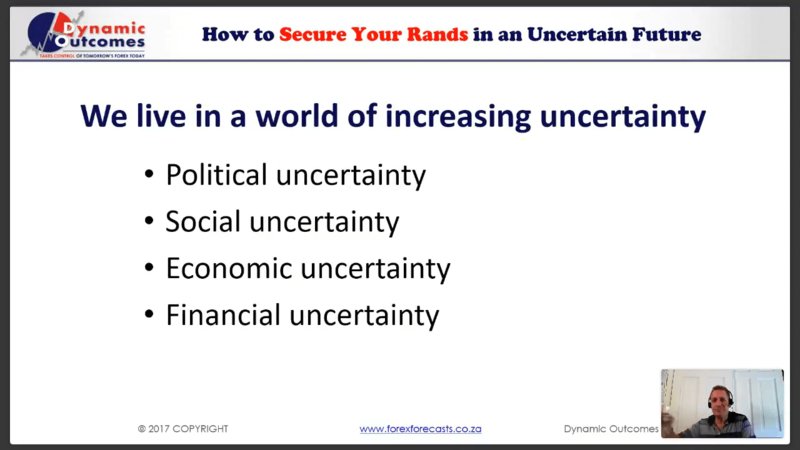 This is just the Rand outlook portion of the webinar - the full episode can be found here. Replay of the Great Rand Debate on 11 February 2014 with Scott Picken and Ryan Pinnick of International Property Solutions (IPS) interviewing James Paynter, of Dynamic Outcomes, and Andrew Rissik, MD of Sable Forex, on what has happened to the Rand, why is it happening and most importantly where is it going? Replay of Webinar on 18 June 2013 with James Paynter and Scott Picken of International Property Solutions on the South African Rand, being an update from the January 2013 webinar, covering what has happened to the Rand in recent months and why this has actually happened, and where the Rand is expected to head from here, and the impact this has on international property investment, with Scott providing some scenario planning based on best and worst case scenarios. Replay of Webinar on 29 January 2013 with James Paynter and Scott Picken of International Property Solutions on the South African Rand, how it has moved historically and why, what are the two basic drivers moving the Rand, where we can expect the Rand to head, and the impact this has on international property investment. Rand Hits 9.00 to the Dollar after Marikana - Where to Now? The Rand plunged to 9.00 against the Dollar early October 2012, with economists and news reporters scurrying around for reasons - the Marikana Massacre, the nation wide transport strike, Moody's downgrade of South Africa's banks, Amplats firing 12000 workers, etc. But all these are classic looking-back economist logic, which does nothing for telling you before the fact what was going to happen...or better still, where to now? James shows on 15 October how we were expecting these moves long before these events occurred...and more.